Tony Schiller, 40-44, strode down the home stretch as the apparent US Master's champion but finished second to Jeff Cuddeback due to a two-minute blocking penalty. Schiller's pre-penalty time would have placed him sixth overall. He ended up seventh, with an official time 1:37 behind Cuddeback. 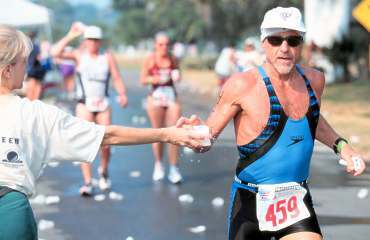 Greyson Quarles, 55-59, grabbed a sponge at the start of his race to wash away the heat and humidity that plagued Clermont. Few people turned down an opportunity to get in touch with water, whether it be in a cup or trapped in foam. 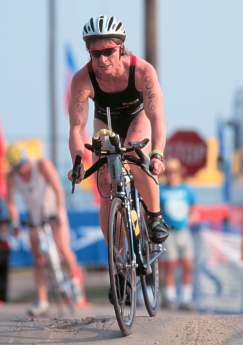 Donna Smyers, 40-44, used a strong bike to pull herself back to the front of the pack after finding herself in 13th place after the swim. 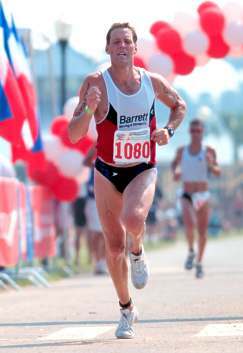 During the last mile of the run Smyers would pass Karen Chequer-Pfeiffer, who was walking herself out of contention, and then stave off a run down by Kelly Molaski to win her first national Master's title by six seconds. 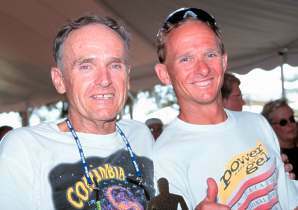 Fred Bartlett, Sr, 65-69, and Fred Bartlett, Jr, 40-44, placed 6th and 7th in their age groups on race-day Father's Day. The high points of their races were their swims with Fred Sr out of the water first in his division and Fred Jr heading for the bike transition in 3rd place. 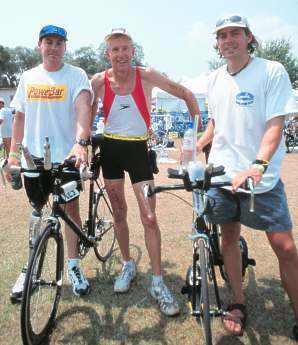 Gary Leske, 60-64, celebrated his Fathers Day by earning a national championship. Leske's twin sons, Brian, physically challenged, and Kevin, 25-29, also braved the Clermont heat and humidity. Gary and Brian have both qualified to go to Kona. 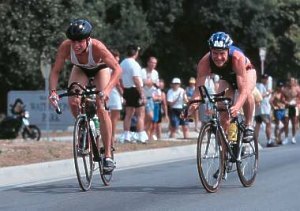 Brian Fleischmann and Bryan Rother work together through the bike to take first and second in the men's juniors at the USA Triathlon National Championships.